Sleep duration and sleep quality are strong determinants of optimum cognitive function. The benefits of good sleep are diverse and subtle, most often in ways we may not realize. Here are some of the biggest perks of getting some good shut eye. The brain is an active organ that obviously doesn’t rest even when the rest of the body sleeps. When you are in deep slumber, your brain is busy working on the impressions gathered during the day, meticulously filing them away in your memory cabinet for later use. We all know by now that night is never a good time to think over problems. Instead when we sleep over a problem, we may be able to look at it with a more logical sense. Sleep does not provide solutions, but the brain that remains active through the night (even while you sleep) is looking for a solution even as you sleep through the problem. So, even if you don’t wake up with an answer, you will definitely wake up with a fresh mind to analyze the problem better. A good 8 hours does loads of good to your mind and body. It helps you become more proactive, improves concentration, focus, attention, rationality, reasoning, lateral thinking, and problem solving. Ample sleep can get your creativity flowing, making it easier to structure and organize your thoughts. This is an obvious one. Good sleep equals higher energy levels which again equals better athletic performance. Athletes who sleep less experience significant decrease in energy levels, display poor judgment on the field/court, and have bad reflex. When you ignore sleep you actually deprive yourself of a number of these physiological and mental benefits and increase stress for yourself. 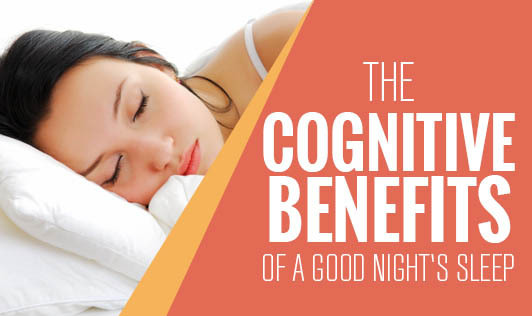 A healthy sleep pattern is essential to gain these cognitive benefits.